The greatest festival of the Bengali community, Durga Puja ranks among the popular festivals in India. It is widely celebrated in West Bengal and other parts of eastern India. It is a four day festival and is dedicated to the worship of Goddess Durga. Immense fanfare and celebration takes place during the Durga Puja celebrations. Durga Puja in West Bengal is usually celebrated in the period between September and October. The start of the festival is marked with Mahalaya, which takes place seven days prior to the main festival. The main festival takes place after seven days. The festival consists of Shashthi, Maha Saptami, Maha Ashtami, and Maha Nabami. The last day of the festival is Bijoya Dashami when the immersion of the Durga idol takes place. On the day of Bijoya Dashami, people meet each other and exchange greetings and young people pay their respects to the elders. 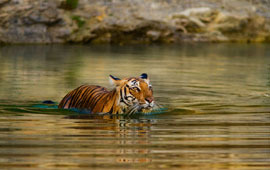 Huge celebrations and fanfare take place all over West Bengal and other parts of eastern India. People of all age groups wear new clothes and go for pandal hopping. Plenty of durga pujas take place all over Kolkata and other cities in West Bengal. The pandals are designed and decorated according to various themes and cultures. Durga Puja is a fine example of the rich culture, heritage and liveliness of the state. To celebrate Durga Puja, all offices, educational institutions and business houses remain closed in West Bengal. Friends, colleagues and well wishers exchange gifts between themselves. Companies and business houses offer gifts to the customers and employees as a gesture of goodwill. The main shopping sale also takes place during this period. Plenty of shops and markets offer heavy discounts and rebates on a wide range of items. The hotels also offer discounts on the accommodation facilities to lure more people during the festive season. Thousands of people come out in the streets and enjoy to the fullest. Traditional Bengali food and other dishes are also cooked during the festival. Apart from Kolkata, Durga Puja is also celebrated with wide fanfare in other places like Siliguri, Guwahati, Mumbai, Patna, Jamshedpur, and Bhubaneswar and so on. 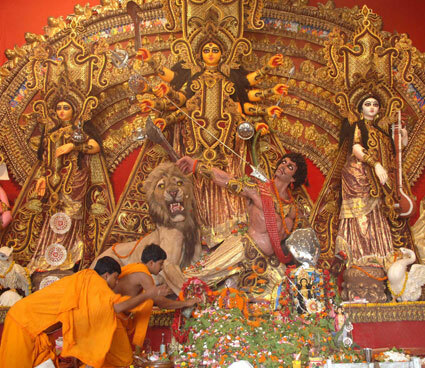 Plenty of non-residential Bengali cultural organizations arrange Durga Puja in the various places in United States, United Kingdom, Australia, Germany, France, Kuwait and other countries.